If you’re strapped for time or you find the idea of designing your own album a little daunting then we can provide you with a professional wedding album design service. All we ask is that you organise your images before we get started. We can start designing your wedding album after an initial consultation. Our initial consultation allows us to get a feel for your style and how you would like your album to look. We can also discuss what album, cover choice and size you like. We can answer questions you may have about the process. This is your most important job! You should review all of your images and place into 2 folders based on how important they are to you. For example, images to be shown as full size across one or two full pages should be placed in an ‘Important’ folder. Images that you’d like included in the wedding album but perhaps used as smaller or background images should be placed in a ‘Less Important’ folder. There is no need to include any images that you don’t want to appear in the album. We will setup a Dropbox folder for you where you can easily drop your organised photos. We will design your album and send you back a proof for approval. You can request changes at this stage. It usually takes about 3 rounds of amendments before the design is approved by you. When we implement any requested changes, we will ask you to give final approval before we start making your wedding album. 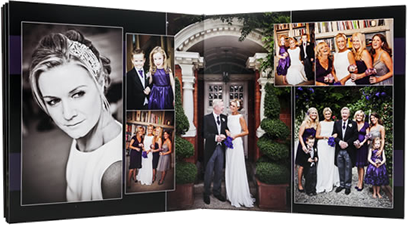 Now you can sit back, relax and wait for your fabulous professionally designed wedding album to arrive at your door! All of our albums are handcrafted so delivery can usually be expected within 5 weeks from the date of final approval. INTERESTED IN OUR DESIGN SERVICE? If you would like a free, no obligation consultation, please fill out the form below and we will contact you.